Hey guys! Spring is FINALLY showing its true colors in our neighborhood and we couldn’t be happier. It’s like a light has switched on inside my head and I am suddenly filled with ambition and “anything is possible” types of thoughts. These are all good things. 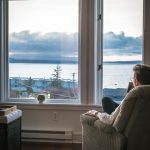 It’s a breath of fresh air from the rainy long-as-heck Seattle winter (pun intended, as always). We’ve got cherry blossoms and other lovely smelling plants and flowers galore over here. While they don’t really make it easy for Nick on our runs (he has to duck when I don’t! ), I wouldn’t trade it for the world. We’re celebrating all of this Spring-y goodness the only way we know how: with F-O-O-D. 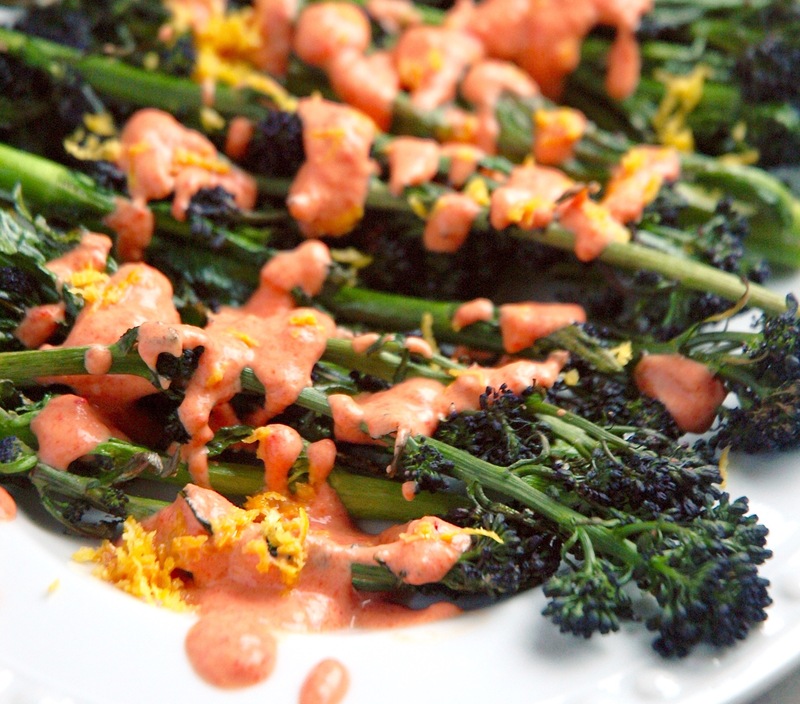 Specifically, Charred Purple Broccoli with Creamy Roasted Red Pepper Sauce. And this lovely side dish is vegan too! 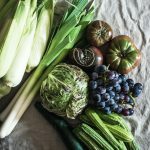 The booths at the farmers market are really starting to burst with vibrant and colorful produce. Nash’s Organic Produce has had a mountain of purple broccoli on display for the past 2-3 weeks (I kid you not — it’s basically the size of Mount Rainier). These folks are so nice and they always give out free samples of their veggies. After tasting some of this purple broc, I knew I wanted to do it up fancy with a special sauce that would enhance its unique purple hue and crunchy satisfying bite. This sauce. Oh man oh man. 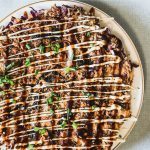 I seem to always have extra cashew cream on hand these days, and I wanted a really simple way to liven it up. 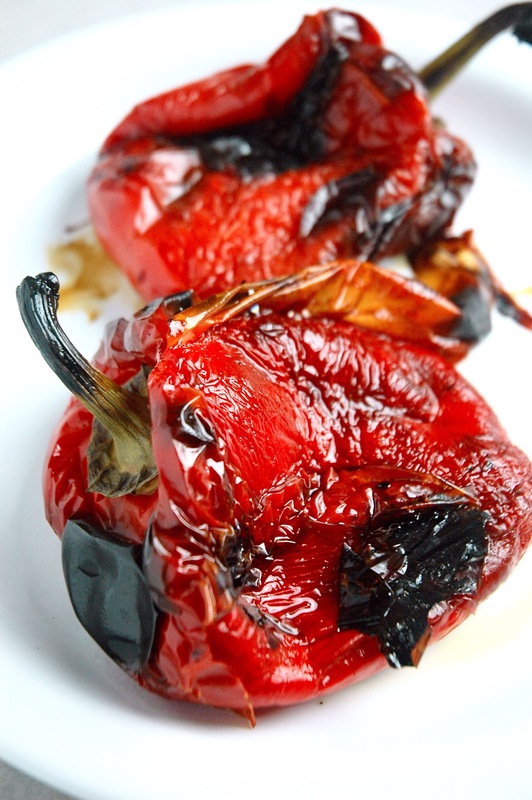 Red bell peppers are one of my favorite veggies to eat raw, sliced thin, but when you roast ’em up in the oven at a high temp, they become so soft and sweet and perfect. And even more perfect when blended into the cashew cream for a delicious and beautiful sauce. This dish could easily be served at dinner or brunch. 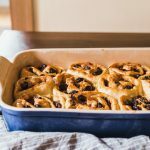 We ate ours for dinner with some simple pan-roasted chicken thighs, but I can definitely envision it served alongside some soft-boiled eggs and hearty toast. 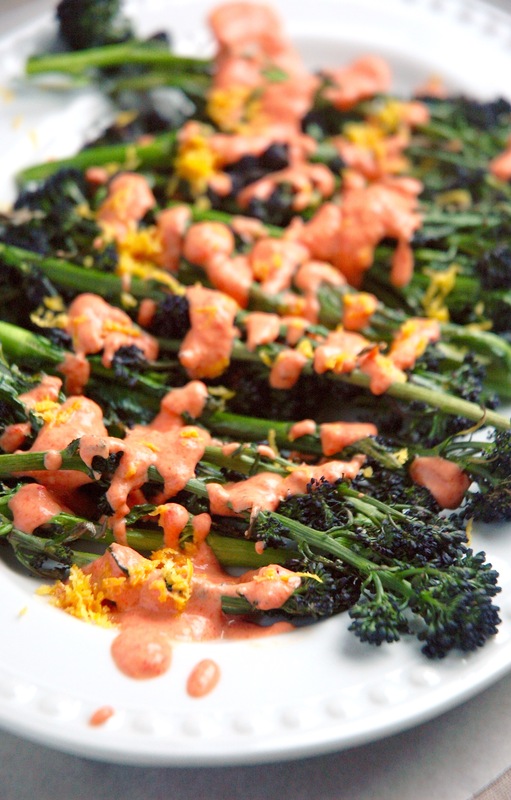 Perfectly charred and vibrant purple broccoli dressed up with a rich and creamy vegan roasted red pepper sauce. 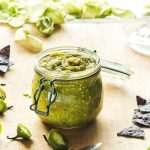 The perfect side for your next dinner party! ROAST: Preheat oven to 500 degrees. Place pepper(s) (I usually make more than one at a time, but this recipe only calls for 1) on a baking sheet lined with aluminum foil and into the oven for 30-40 minutes. Turn twice during cooking. When the skins are charred on all sides and wrinkled, remove from oven, wrap tightly with foil and set aside until cool enough to handle (about 30 minutes). Reserve baking sheet. 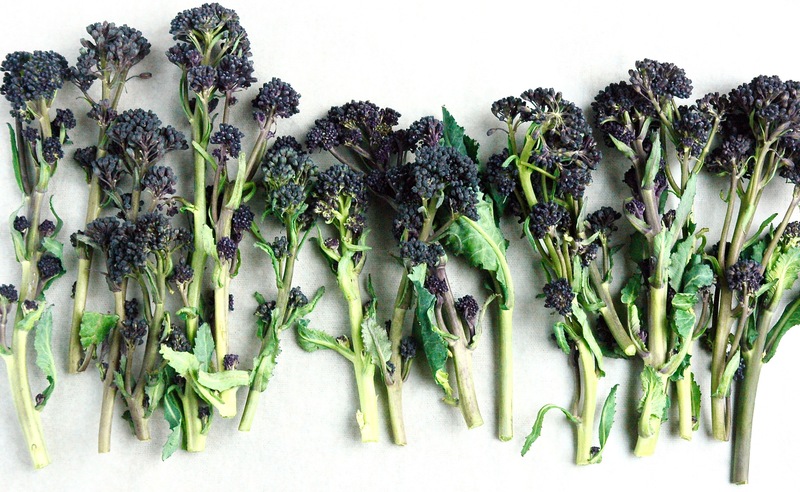 CHARRED PURPLE BROCCOLI: Reduce oven temp to 425 degrees. 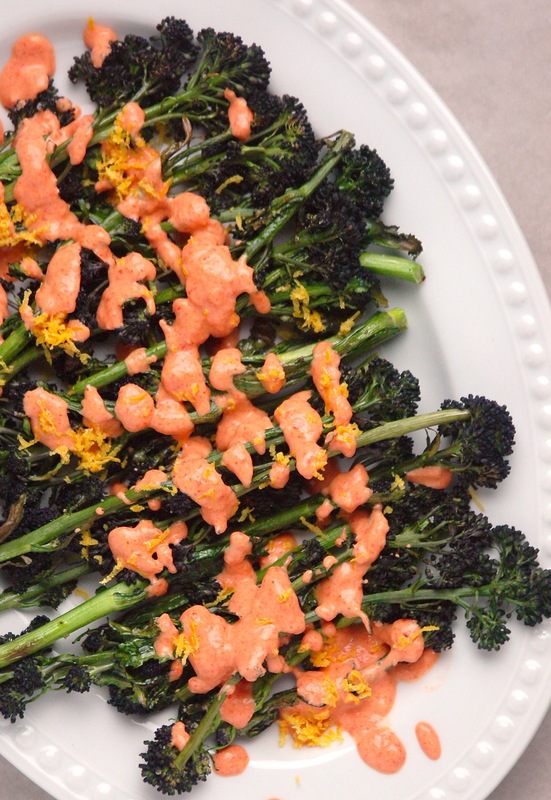 Spread broccoli evenly on baking sheet, drizzle with olive oil and red pepper flakes. Season with salt and pepper to taste. Roast broccoli in the oven until slightly charred and fork tender (10-15 minutes). 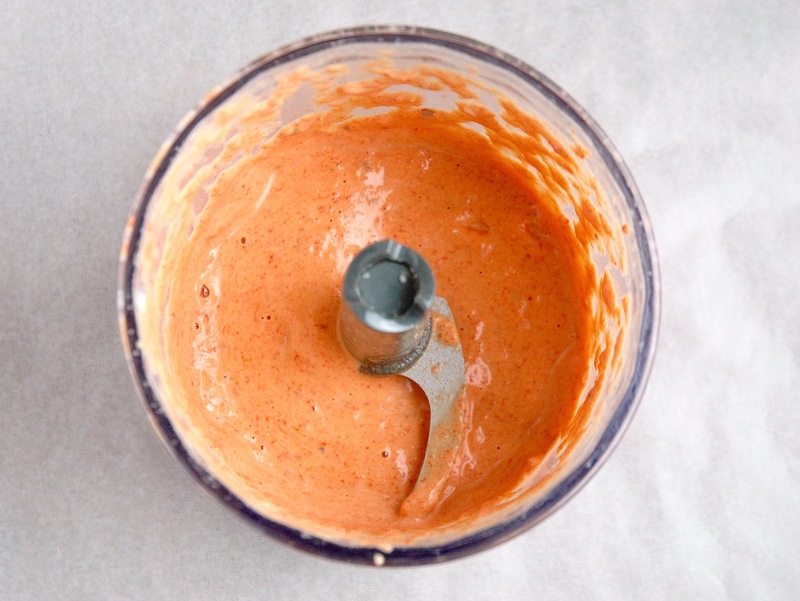 CREAMY ROASTED RED PEPPER SAUCE: Remove skin, stem and seeds from the roasted red pepper and discard. Add red pepper + the rest of the ingredients into a small food processor or blender and process until smooth. Season with salt and pepper to taste. (Makes about 1/2 cup). SERVE: Lay broccoli on a platter and spoon the sauce evenly over the top. You can serve any additional sauce on the side for dipping. If you're cooking extra roasted red peppers, cover additional peppers with olive oil and store in an airtight container. They should keep in the fridge for a couple weeks. We use these guys on pizza, sandwiches, etc! This recipe would work well with regular broccoli too.